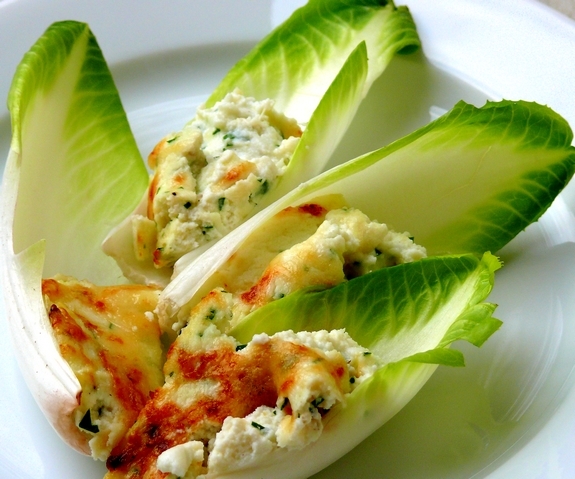 Another holiday appetizer that’s not time-consuming or fussy to put together. It can even be prepared 1 day in advance and broiled right before serving time. This is a nice detour from other heavy dips because it tricks you into thinking you are eating something light. You can thank the herby flavor and using endive as the vehicle for delivery to your mouth for that. In fact it’s almost palate cleansing, nice for serving with bubbly and an array of white wines. Broil this dip up and place it far away from the kitchen so you can finish up your holiday meal without incident. Everyone will appreciate the presentation as well, it’s quite striking surrounded by the endive. Heat broiler. 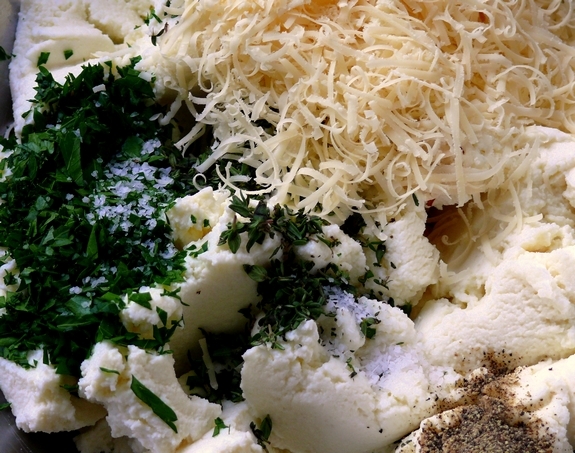 In a medium bowl, mix together the ricotta, parsley, thyme, cayenne, 1/2 cup of the Parmesan, 1 teaspoon Kosher salt and 1/4 teaspoon black pepper. Transfer the ricotta mixture to a shallow, broiler-proof 1 quart baking dish, drizzle with the oil and sprinkle with remaining 2 Tablespoons cheese. Broil until the top begins to brown…this could take anywhere from 3-7 minutes depending on your broiler, make sure to watch it closely. 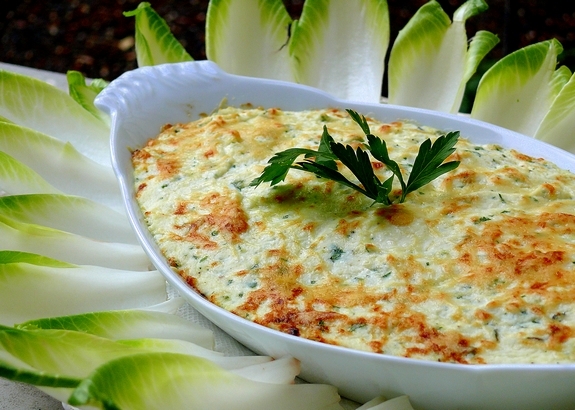 Serve warm with the endive. Preheat broiler. In a medium bowl, mix together the ricotta, parsley, thyme, cayenne, 1/2 cup of the Parmesan, 1 teaspoon Kosher salt and 1/4 teaspoon black pepper. 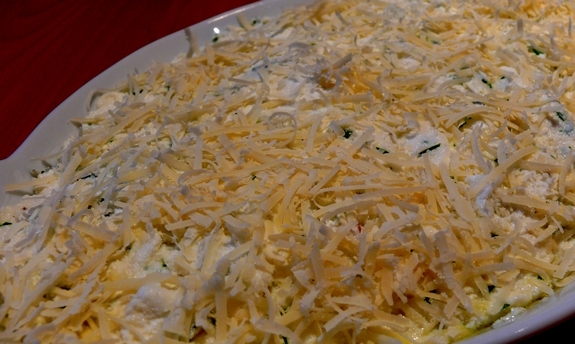 Transfer the ricotta mixture to a shallow, broiler-proof 1 quart baking dish, drizzle with the oil and sprinkle with remaining 2 Tablespoons cheese. Broil until the top begins to brown...this could take anywhere from 3-7 minutes depending on your broiler, make sure to watch it closely. Have a great Thanksgiving, Cathy! Your recipes always sound so good and your photography is excellent! I may just have to make this one for Thanksgiving. Mmmmm! Thanks for sharing! I love this!! I must make for the holidays. Warm ricotta cheese is so pillowly and smooth. Made it with dinner tonight. Delicious. We did learn that you should not use part-skim ricotta, but the flavors were very good. YUM! I love this recipe. Love ricotta. Love hot cheese. Love the endive. My mouth is watering after reading this recipe. Will definately be making it later this week. PS: This is my favorite recipe website! I’ve referred lots of friends to it. This recipe was a big hit at our Celebration…Making it again for Christmas….This is a 10!! !